Hackers use small businesses to get to the big businesses. If a hacker uses a cyber attack on your business as a stepping-stone to a larger attack, your partners are going to come after you big time. Small businesses are easy to hack. In fact, 58% of businesses breached have been small businesses. See #1. Hackers will use low-hanging fruit to get at high-value targets. Hackers will target any firm that provides them will data they can resell or use to access bigger fish. Even if the data being targeted doesn’t have resale value on the darkweb, a ransomware attack can make low-value targets more profitable. Anti-virus and anti-malware solutions are certainly an important part of a risk management program, but there is so much more to it. A layered approach is required. The layers will depend upon your firm’s goals and risk tolerance. But software alone will not protect your business. 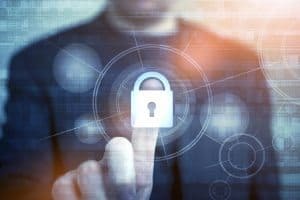 To truly protect your organization, you need a total solution that encompasses everything from employee training to insider threat detection and disaster protection. Strong passwords are great. But passwords alone won’t keep your business secure. Two-factor authentication is essential for user security. A robust cybersecurity risk-management program requires buy-in from the C-level. Also, your employees must be trained on cybersecurity best practices, like how to spot phishing scams and avoid unsafe links. Today’s modern malware is much more stealthy and hard to detect. Businesses require a 24×7 monitoring solution to detect breaches. Your IT partner will keep an eye on your network and remediate detected anomalies. Insider threats should be monitored. Insider threats can come from anyone on the inside, from disgruntled employees looking for professional revenge to content employees without proper cybersecurity training. Businesses should not allow their employees to use public wi-fi, password protected or not. The solution: VPN. Employees who use their personal devices for work-related activities need to follow the same protocols put in place for all of the network’s computers. Cybersecurity is a continuous effort. Threats evolve, solutions evolve. You must continuously monitor your systems, conduct internal audits, and review, test, and evaluate contingency plans. Security must be considered in every aspect of network and mobile technology that the organization uses. There is no one-size fits all approach to cybersecurity. ACE IT Solutions can tailor a cybersecurity program matched to your specific risk profile. By partnering with ACE IT Solutions, organizations can thwart hackers attempts and respond quickly to minimize the costs of a breach. By partnering with the most respected and innovative names in cybersecurity, we are well positioned to create highly effective security solutions. Our security minded clients with the right strategy in place will be better prepared and protected for any potential threats or hacks and for future cybercontrol initiatives they will be implementing. Contact us at 646-558-5575 to set up a cybersecurity assessment.